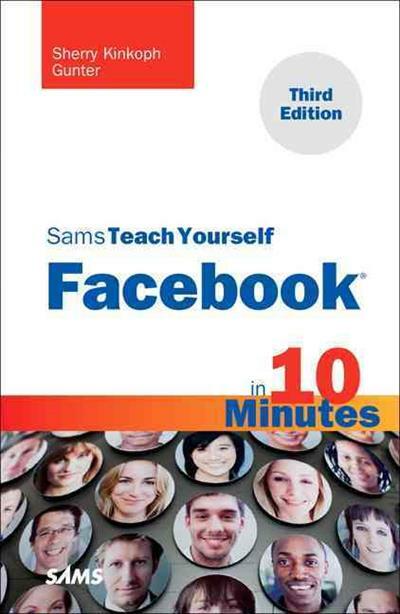 Sams Teach Yourself Facebook in 10 Minutes 3/e is a quick way to learn what Facebook is all about and how to get involved with this phenomenally fast-growing social network without wasting precious online time or a lot of offline time reading gobs of text. Readers will learn how ... read full description below. 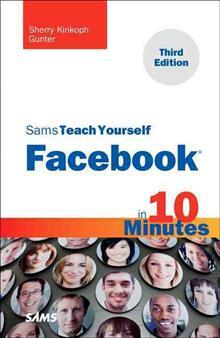 Sams Teach Yourself Facebook in 10 Minutes 3/e is a quick way to learn what Facebook is all about and how to get involved with this phenomenally fast-growing social network without wasting precious online time or a lot of offline time reading gobs of text. Readers will learn how to utilize Facebook in quick and easy steps and pertinent information. Coverage includes how to create and set up personal and professional accounts (called profiles and pages), manage friend connections, communicate and share news and interests (messaging, newsfeeds, and updates features), share photos and videos and other media, guard privacy, find applications, buy and sell items on the marketplace, and more. With another new page design introduced this year (March 2011), it's timelier than ever for a book that helps users unlock all the potential Facebook has to offer in its latest incarnation. The new profile pages have reorganized content and core features, doing away with feature tabs and adding a new photo strip. You can now easily see which friends are online, access bookmarked applications, and see what your friends are up to. Sherry Kinkoph Gunter has written and edited oodles of books over the past 20 years covering a wide variety of computer topics, including Microsoft Office programs, digital photography, and web applications. Her recent titles include Easy Microsoft Word 2010, Craigslist 4 Everyone, Teach Yourself VISUALLY Microsoft Office 2007, and Microsoft Office 2008 for Mac Bible. Sherry began writing computer books back in 1992 for Macmillan, and her flexible writing style has allowed her to author for a varied assortment of imprints and formats. Sherry's ongoing quest is to aid users of all levels in the mastering of ever-changing computer technologies, helping users make sense of it all and get the most out of their machines and online experiences. Sherry currently resides in a swamp in the wilds of east central Indiana with a lovable ogre and a menagerie of interesting creatures. Sherry is also hopelessly addicted to Facebook.